← The Hard Sell on Salt. 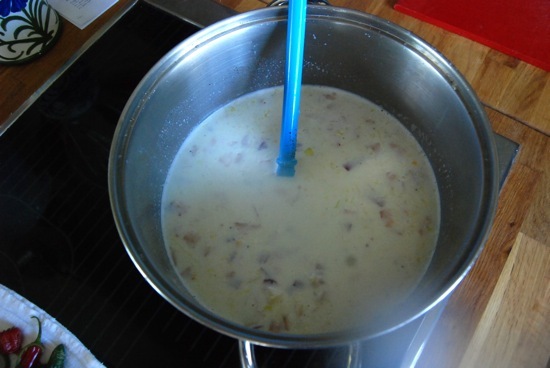 Chowder – or Chowdah, as it’s more commonly known in New England, has become my family’s soup of choice. Since moving to Maine, we’ve sampled dozens of local varieties, from the ubiquitous Clam, to Lobstah (of course), as well as Seafood, Potato, Corn and more. 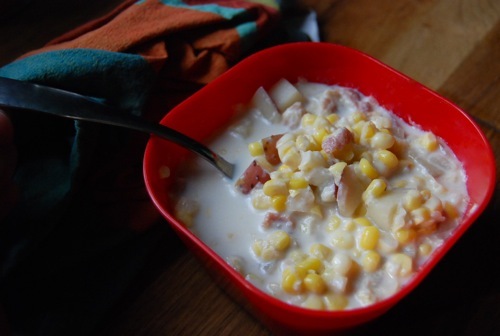 This recipe, full of toothsome kernels, bits of bacon and potato, blows canned ‘low salt’ chowdah out of the water. If you’re lucky enough to have the ingredients on hand, run skip or jump your way to the kitchen NOW! You heard me. Ayuh. 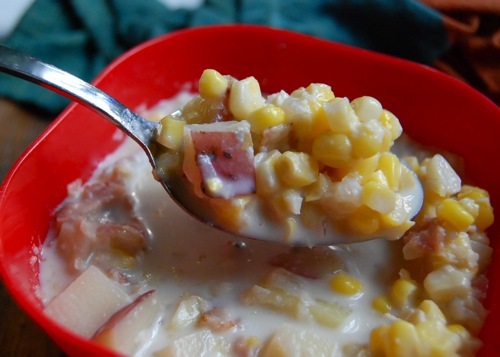 Using a serrated knife, carefully remove corn kernels from the cobs and set aside. Place a stock pot over medium-high heat. Add the onion and bacon and cook, stirring, 3 minutes. 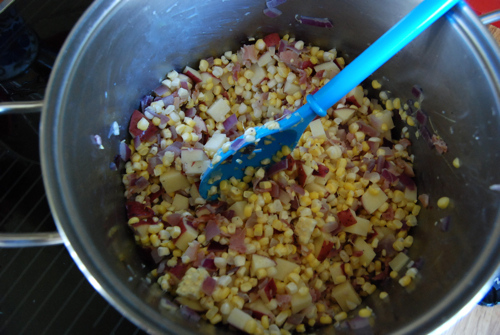 Add the corn kernels and diced potato and stir to combine. Cook, stirring, about 7 minutes, then add the milk and freshly ground black pepper to taste. Lower heat to medium and bring to a gentle boil. Once boiling, reduce heat to low and simmer until vegetables are cooked through. Remove from heat and serve immediately.